This week, Starbucks launched a new campaign called #RaceTogether, an initiative designed to encourage baristas and coffee drinkers around the country to "have a conversation" about race. Although many of us mistook the headlines for a satirical entry on The Onion, the company confirmed that Starbucks employees now have the option of writing #RaceTogether on a customer's cup. If this happens to you, then you'll know you've been selected to say something about race. Despite a steady stream of criticism and concern expressed on social media by anti-racists across the color spectrum, the company seems intent on pressing forward. To some, encouraging people to "talk about race" sounds like a step up from a culture that all too often proffers the post-racial fantasy that racism is a "thing of the past". Isn't it anti-racist to take a stand and say that racial inequality is a legitimate and important topic of conversation? Well, sure, but this is not what Starbucks has proposed. Rather than thinking through the best practices that might foster a productive discussion about race and racism, the company executives seem content to just sort of tell everyone else that they need to discuss the topic without providing any educational resources or guidelines whatsoever. In a letter to employees, Starbucks CEO Howard Schultz stated that he conceived of the idea "not to point fingers and not because we have answers, but because staying silent is not who we are." In other words, while Schultz thinks race is a really important topic, he has nothing in particular to say about it except that there is no one to blame. Many questions immediately spring to mind: What civil rights groups, anti-racist organizations or diversity experts did Starbucks consult in crafting #RaceTogether? Why is Starbucks' leadership team lacking in gender and racial diversity? One can easily imagine that both white and non-white people might feel racially profiled when receiving a cup with the dreaded hashtag. Did the company provide employees with guidelines for how to select customers to "join" in the conversation? There is also the issue of consent. What about those of us who have no desire to be asked about a painful topic by a perfect stranger? Are people of color now going to have to wear t-shirts to Starbucks that say: "Please don't ask me about race and don't touch my hair"? What happens when conflict arises, as it inevitably will in any public discussion of race? Will Starbucks provide therapy for employees and customers who feel traumatized by the racist ideas they are sure to hear in their stores? On social media, the #RaceTogether hashtag has already been hijacked by racists. What does Starbucks have to say about that? When asked on Twitter whether Starbucks employees received diversity training before being asked to start conversations about race with customers, the company replied: "We don't presume to educate communities on race, only to encourage an open dialogue." The trouble with this, however, is that it is socially irresponsible for a company to subject employees and customers to no-holds barred discussions of race. 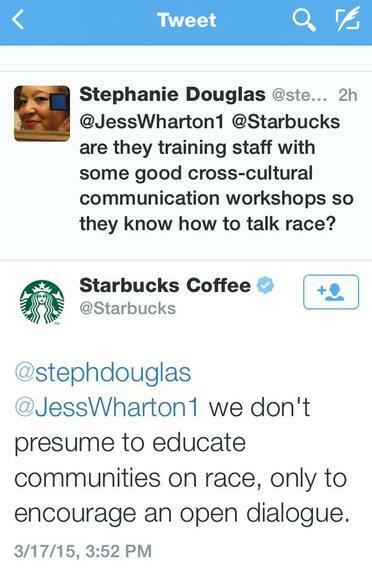 While Starbucks suggests that "talking about race" is "worth a little discomfort", the company has a responsibility to consider what it can and should do to take into account the perspectives of people who actually have to deal with racism and don't have the option of treating it as an optional topic of discourse in the coffee line. One of the reasons why it is so difficult to have public conversations about race is the fact that very few people have actually studied race seriously, either on their own or within an educational setting. Starbucks is actually contributing to the misconception that "race" is something that doesn't require education to discuss. The truth is that many people have never taken a class on the subject, attended an anti-racist workshop or even read a book about the history of racism. Conversations based on racial ignorance are actually quite harmful and have the potential to alienate people who have experienced racism or lost loved ones to racial violence. As an anti-racist educator, occasional coffee drinker and woman of color, I do not want to hear random members of the public who have not studied race share their uninformed opinions with or around me in the early morning hours. Research on racial attitudes has demonstrated that there are wide swaths of the majority population who believe that talking about race at all is racist, that critiquing white people individually or collectively is inherently hateful and that racism is over (if it ever existed in the first place). Such ideas minimize or outright deny the existence of racial inequality and white supremacy in our society today. As philosopher Charles Mills explains, these forms of denial produce an "epistemology of ignorance"--a way of knowing and constructing the world built on a lack of knowledge about the social and political realities of race. Unfortunately, Starbucks' ill-conceived campaign seems to exemplify the kind of ignorance that makes racism such a difficult thing to confront and contest. Anti-racist whites and people of color alike have considerable expert knowledge that could have been brought into consideration by Starbucks executives before they decided to push forward with #RaceTogether. Employees could have been (but apparently were not) educated about how to talk about diversity as well as the history and legacies of racial inequality. Customers could have been provided pedagogical material about race. Starbucks executives themselves could have conducted an internal study of institutional racism within their own organization and shared the findings with members of the public. The bottom line is that while we absolutely need multiracial dialogue about race and collective action against racism, we do not need an uninformed, non-consensual, conversation. If all Howard Schultz wanted to do was create a viral marketing buzz that might sell more machiattos, then #RaceTogether has already been a smashing success. But if the company wants to do something to actually address racism, then Schultz and his executive team have a lot of learning to do.